Although the small and large set of lifting knives that I make and sell are intended primarily for lifting, I find the smaller knife also useful for paring the edges of a spine that has been removed. The edges need to be pared to achieve a smooth join when it is replaced. Some binders use a Dremel or Foredom tool, and Jim Reid-Cunningham demonstrated this at the Guild of Book Workers 2013 Standards Conference in Washington DC last week. He used a conically shaped coarse grinding stone. Some binders use a scalpel for this, though I haven’t found a blade shape that is easy for me to use. I generally use a small lifting knife which gives me a lot of control, especially when paring a spine with raised bands intact. Notice that I am working with the knife bevel down. This raises the angle I hold the knife at considerably so that I do not have to flatten out the spine. It also allows me to quickly adjust the angle of the knife to match the curve of the leather of the bands. Whichever method you use, likely the most important aspect is to lift the spine as smoothly, cleanly and evenly as possible in the first place. The leather on many old spines is often very delicate, and even the sharpest of knives doesn’t pare the leather at the edges properly, pulling bits away when you don’t want it to. Moreover, the complete spine invariably needs shaving and thinning down. To this end, we use a benchtop linisher or belt sander, which runs at slow speed. Instead of the usual 2800 rpms, ours runs at 1400rpms, with a 6″ wide belt, giving considerably more control. At this slow speed, fingers can easily touch and bear against the moving sandpaper with reasonable impunity (to the fingers!). Bits of flaky leather do fly off at the edges sometimes, but this doesn’t matter. Losses are expected in this paring process. We find that one can achieve considerably better results around the periphery of the old spine piece, on the whole, than with a paring knife. 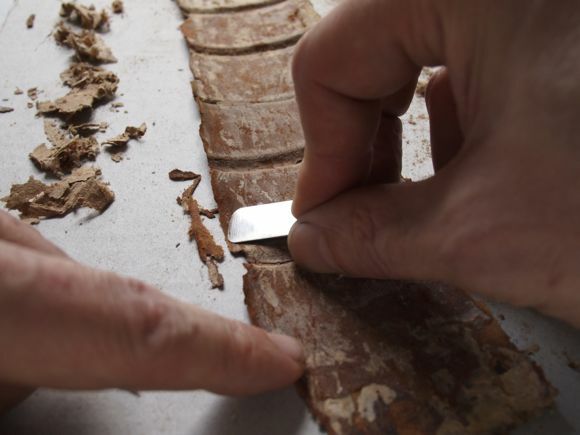 Furthermore, the sanding process allows one to thin out the leather over the whole of the spine, getting rid of old encrustations, with very good results. 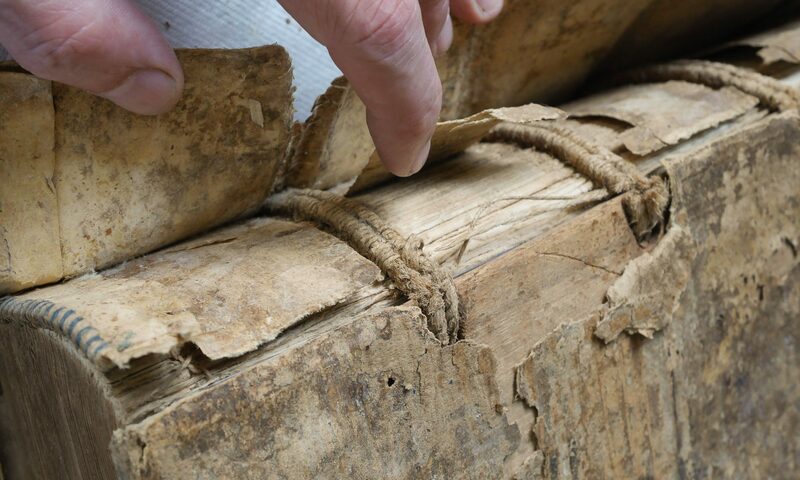 It is important to free up the whole spine of all encumbrances – old glue, old linings – before re-laying it over the new leather spine. In this way, the old spine piece is made flexible, so that it will move with the new spine movement, and not want to crack or lift off where otherwise old encrustations might still be present. It takes a fair degree of control and focussed attention using a sander to pare old spines, but with practice, we find that it works very well. This is a process which may not be suitable for every workshop, though, as the process throws up a good deal of old leather dust, even with a vacuum attachment. It really requires a separate workshop for such dusty jobs.